Hate the cold? Quit your bitching and get some soup. Twice last week, I woke up to a city blanketed in fresh snow. On Monday, I walked to work, wrapped up to my ears in a thick scarf, while my fingers, though gloved and burrowed in my pocket, went numb. At 8:30am, the thermometer struggled to creep up into the double digits. Today, the snow was back, swirling in pretty white gusts outside my window, big fat snowflakes fluttering by dizzyingly. Needless to say, winter is in full force in New York, and while some people absolutely hate it and are already counting down the days to spring, I for one, am enjoying it. And why would I not, when there’s so much good soup to be had! A couple of months ago one of my ramen-loving coworkers told me about Ippudo NY, a popular (and always uber busy) ramen spot near the East Village. It was good that first time I went but with the recent frosty weather, I knew it was time to revisit. And really, what better comfort from the cold and slush is there than a large red bowl full of hot, soothing deliciousness? The correct answer is none. There is no better comfort. 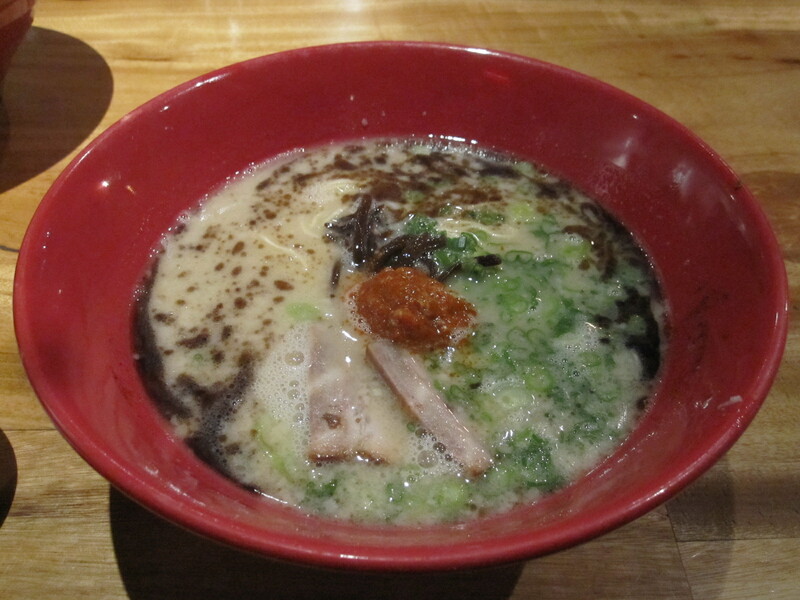 The Akamaru modern I had at Ippudo was all the comfort I could ever ask for. Vibrant, flavorful broth full of long, stringy noodles, pork belly chashu, cabbage, kikurage (a type of fungus) scallions, miso paste and garlic oil— mmm, I feel warm and fuzzy just thinking about it. This soup was enough to make me wish for just an extra month of winter and one less of summer. Yea, I said it. This entry was posted in Lunch and tagged Akamaru Modern, cabbage, East Village, garlic, Ippudo, miso paste, pork belly, ramen, soup. Bookmark the permalink. angie, just catching up on the bloggity blog and your writing is superb! really enjoying it 🙂 so this is what you do when i dont see you everyday??? acceptable. Aww thanks for reading, as usual. And yes, this is what I do. I only have enough time to eat and write about eating. Nothing else.